It was an absolute delight to work on Ella and David’s summer wedding flowers. 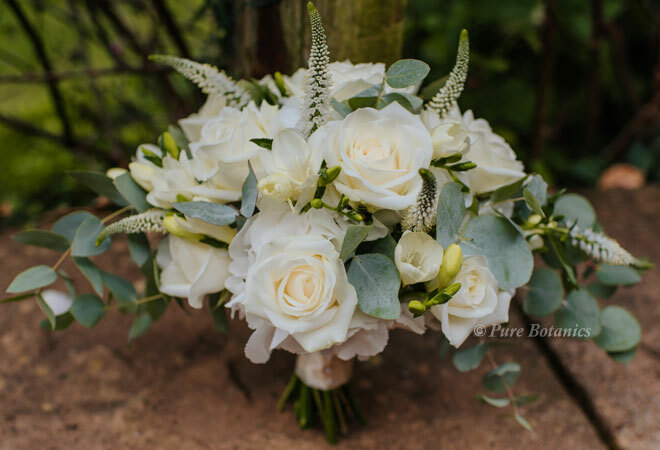 I hope you enjoy seeing their beautiful photo’s and super choice of flowers for their church wedding in Coventry and wedding reception at Nailcote Hall in Warwickshire. 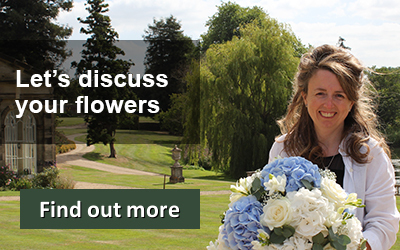 When I first met Ella and David at Nailcote Hall for their wedding consultation they had a really clear vision for their wedding flowers. Ella wanted a very natural style of flowers with plenty of soft foliages. Although they were going for a natural look they still wanted glamour and elegance and for the flowers to add a real wow factor. Ella had seen a bouquet with a natural crescent shape so I took this as inspiration for her bouquet that you can see above. 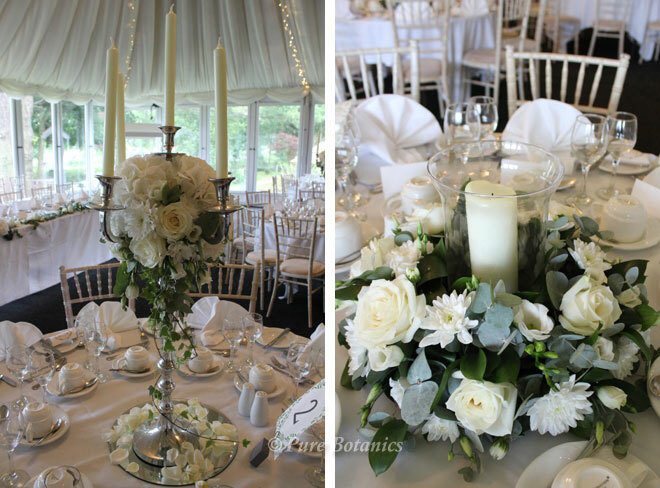 I used ivory ‘Avalanche’ roses with freesias and veronica giving it fragrance and natural elegance. 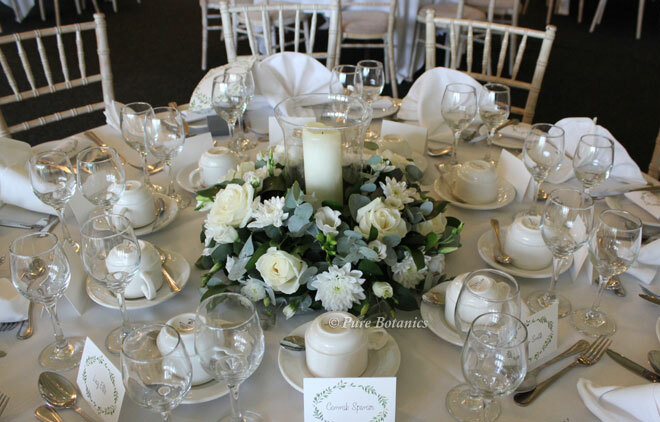 The flowers were arranged with silver eucalyptus leaves, which went really well with the soft natural wedding colour theme. 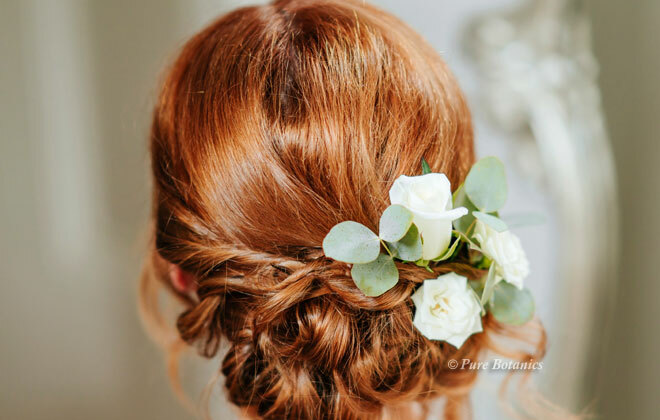 For Ella’s hair I individually wired pieces of eucalyptus and ivory bud roses so that the hairdresser could easily insert them into her hairstyle. Once the wedding bouquets and buttonholes had been delivered to Mum’s house in Coventry I went and set up the church wedding flowers. The couple decided on the beautiful ivory hydrangeas, which I tied to the ends of the pews with coordination lace ribbon. I also place the large pedestal arrangement near to the altar. 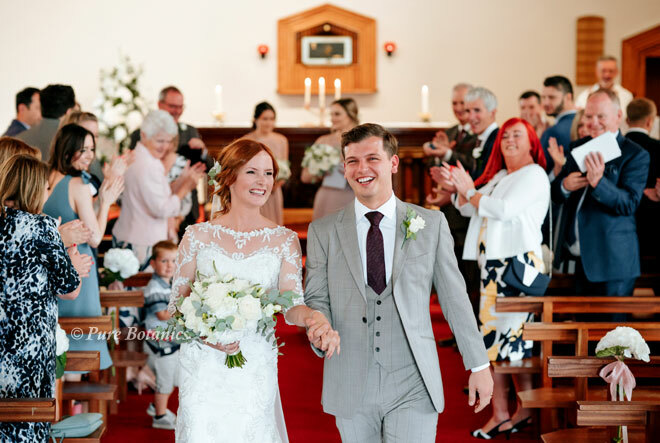 I love the photo you can see below of the couple leaving the church with beaming smiles and absolute joy on their faces. My final delivery was to Nailcote Hall as the couple had chosen the marquee as their wedding breakfast venue. 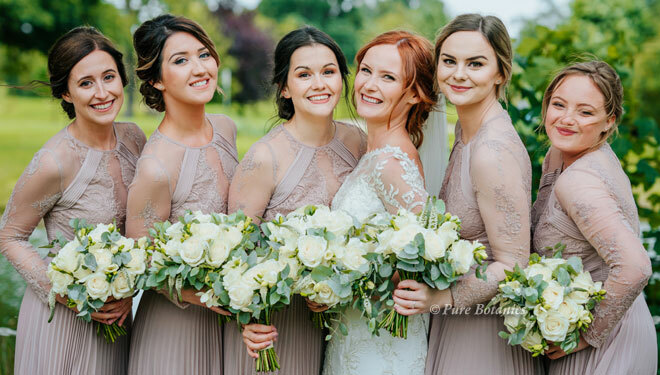 You can see all the girls in this stunning photo above as they pose with their flowers in the grounds at Nailcote Hall. 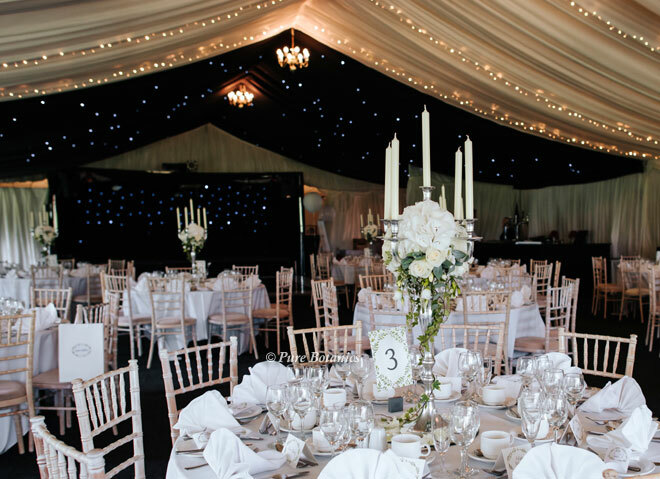 This venue has a well-maintained golf course very close to the marquee, which provides an excellent backdrop for photos. 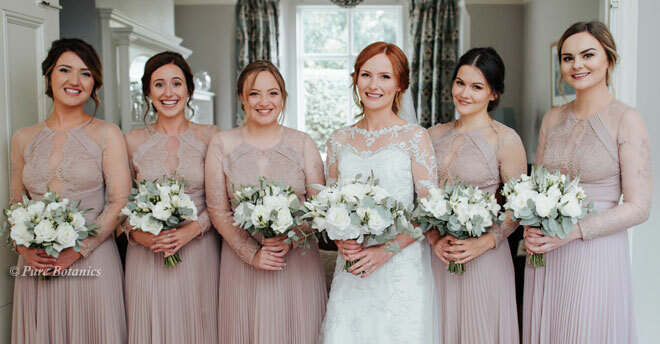 You can see more of our weddings at Nailcote Hall on our featured page. 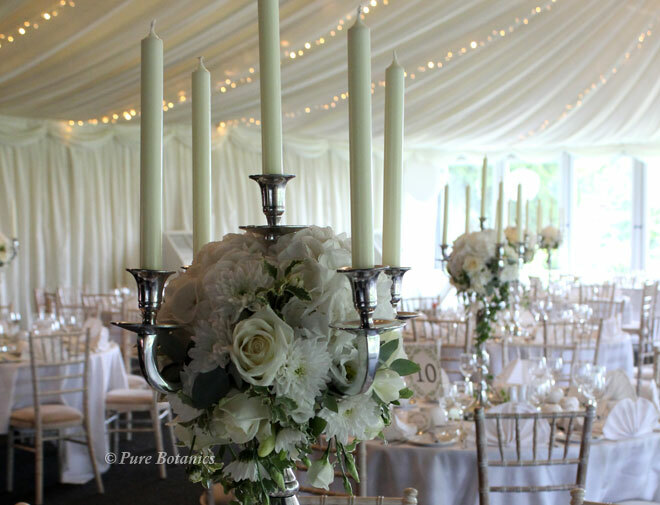 To add glamour and wow factor Ella and David chose our stunning candelabra arrangements. 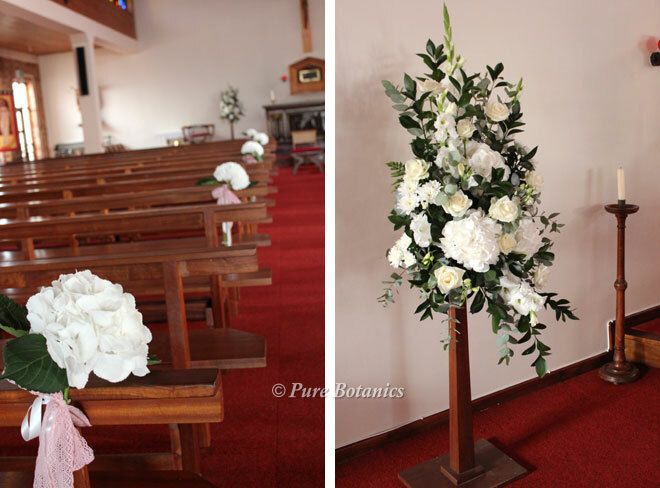 I decorated them with a full all round display of roses, freesias and hydrangeas with eucalyptus leaves. As it was a large wedding with lots of tables they decided to have the centre tables with candelabras and the outer tables with our low hurricane vases surrounded by beautiful roses and freesias. 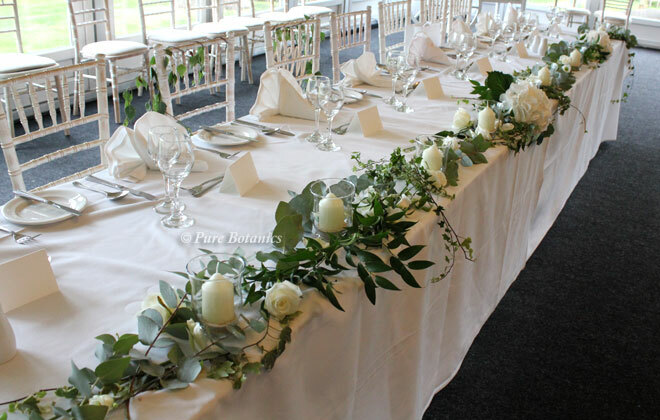 For the top table Ella asked me to create a very natural garland that twisted around our mini hurricane vases, to link with the table arrangements. I really enjoyed creating this piece at the venue. 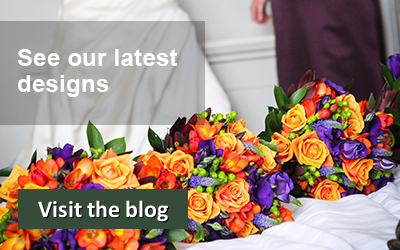 Whatever your wedding flower ideas are be sure to contact us to see what we can create especially for you. See more of our wedding table flowers.